Learn how GreenWood entrepreneurs are earning a livelihood and preserving forests. See more videos of our work. The Model Forest program originated in Canada in 1992, and the concept has since expanded to encompass forests all over the world, of all types and under a wide variety of ownerships and management objectives. According to the FAO, Model Forests "promote the partnership of stakeholders for the development, testing, implementation and demonstration of innovative, sustainable approaches to the management of forests for a range of benefits. Apart from the international recognition, our successful guitar-part enterprise has attracted the attention of two neighboring community forest organizations, Limoncitos and Miraveza. Together, their three managed forests comprise approximately 75 percent of the forested area on the western buffer zone of the 1.2-million-acre Río Plátano Biosphere Reserve. 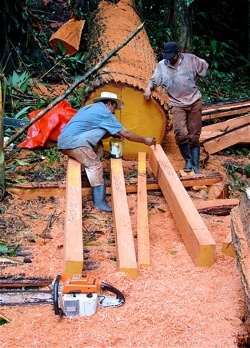 They provide an increasingly powerful bulwark against the depredations of illegal logging and destructive agricultural practices. There's no stronger validation of a good idea than the fact that others want to learn from it and replicate it.